Botanical Garden Of Sedan : In 1875, the Mayor Auguste Philippoteaux asks the architect Edouard depaquit to set a town planning of Sedan and create a kind of ”green long of the town” : the botanical garden. Rares species of trees are planted round a small pool and a bandstand. The visitors are able to go for a walk on paths. 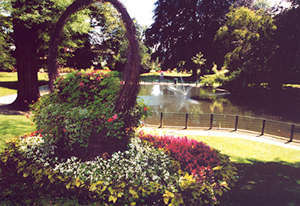 Since then, the site has been extended with a rose garden and games for children. The entrance is avenue Philipotteaux, Alsace-Lorraine square and the visitors will be able to stroll along in a flowered site, among copper beeches, chesnut trees which are age-old. In spring, inhabitants of Sedan take pleasure in looking at the several varieties of magnolias flowering. From 7.30 am to 7 pm every day.